The House met at 4:30 p.m. It being Wednesday, we will have the singing of the national anthem led by the hon. member for Newmarket—Aurora. The Parliament, which had been prorogued on September 13, 2013, met this day at Ottawa for the dispatch of business. The House met at 4:30 p.m., the Speaker in the chair. The Speaker read a communication from the Secretary to the Governor General announcing that Their Excellencies, the Governor General and Sharon Johnston, would arrive at the Peace Tower at 4:30 p.m. on Wednesday, October 16, 2013, and that when it was indicated that all was in readiness Their Excellencies would proceed to the chamber of the Senate to formally open the second session of the 41st Parliament of Canada. It is my duty to inform the House that vacancies have occurred in the representation: namely, Mr. Vic Toews, member for the electoral district of Provencher, by resignation effective July 9, 2013; Mr. Bob Rae, member for the electoral district of Toronto Centre, by resignation effective July 31, 2013; and Mr. Mervin Tweed, member for the electoral district of Brandon—Souris, by resignation effective August 31, 2013. Mr. Speaker, it is the pleasure of His Excellency the Governor General that this honourable chamber attend him immediately in the chamber of the Senate. I wish to inform the House that in accordance with the representation made by the government pursuant to Standing Order 55(1), I have caused to be published a special Order Paper giving notice of government bills and motions. I therefore lay the relevant document upon the table. The House leader of the official opposition is rising on a point of order. Does the hon. opposition House leader have the unanimous consent of the House to propose the motion? The Speaker: There is no consent. I see the hon. member for Timmins—James Bay rising. If he will be patient, we will get through orders of the day and then I have received notice from him. Is the hon. government House leader now rising on a point of order? Mr. Speaker, yes. With regard to the point of order raised by the opposition House leader, I find it highly unusual that he raised it at this time. I do not know why he offered to do so before we even started entertaining the throne speech, as he will have ample opportunity to speak to this later. However, in brief, I would say that the motion that has been put before the House, proposed on the Order Paper as government Motion No. 2, represents a balanced approach to restore the business of the House to exactly what it was back in June. That included the ability to return government bills to the House to be entertained, but also to restore the mandate of every committee, whether that was a mandate that was established by the opposition or proposed by the opposition or otherwise. In fact, everyone's business is preserved. It is a balanced and fair approach so that no one on any side of the House, including the independents, who has an interest is prejudiced by the fact that we have prorogued. That is the simple purpose of the motion. It is balanced, it is fair, and what is more, it is entirely consistent with the past practice of the House. I expect I will return to this more fully when we are closer to actually debating the motion rather than today. I look forward to those further interventions on the point. The Speaker: Does the Right Hon. Prime Minister have the unanimous consent of the House to have the bill printed? Let us begin this day together by honouring in silent reflection those whose lives were tragically taken at Lac-Mégantic. I come before you today as one proud Canadian among a vast nation of these, sincere in congratulation on this opening day of the Second Session of the Forty-first Parliament of Canada. I bear the happy wishes and deep affection of Her Majesty Queen Elizabeth II, Queen of Canada, whose family has this year been blessed with the birth of Prince George. Parliamentarians, you gather today with the high confidence and higher expectation of Canadians. Remember that our nation has embraced a unique set of indelible qualities that must guide your deliberations in this Parliament. Consider this: we are inclusive. We are 35 million people gathered from every part of the world. We welcome the contribution of all those who inhabit this land—from the first of us to the latest among us. This year, we celebrate the 250th anniversary of the Royal Proclamation. This extraordinary document is part of the legal foundation of our country. It recognized the rights of Aboriginal people in Canada for the first time and established the basis of their relations with the Crown. Consider this: we are honourable. People of peace, we use our military power sparingly; but when we do so we do so with full conviction, gathering our forces as men and women who believe that the freedoms we enjoy cannot be taken from us. This clarity focuses our might in terrible times. And wherever and whenever we unleash that might, we raise our grateful voices and our prayers to honour those who have stood in harm’s way for us. Consider this: we are selfless. Our survival has been sustained by humility and acceptance of our mutual interdependence. Giving lies in our very nature, certain in our hearts that none but the gift passed from an open hand will multiply as those we help better themselves, those they love and, at length, the country they call home. Consider this: we are smart. We deplore self-satisfaction, yearning rather for self-improvement. We love learning and cherish our right to it. We are united, prosperous and free precisely because we ensure that Canadians have opportunities to learn, excel, advance, and thus to contribute. Consider this: we are caring. Our abiding concern for the common good of our neighbours—in each community—makes us responsive. We do not abandon our fellows to scrape by in times of distress or natural disaster. Inspired by our common bond, we come swiftly and resiliently to the aid of those in need. Today, as we contemplate our 150th anniversary, the eyes and ears and expectations of Canadians turn toward this Parliament, in trust that those who stand here in their place will relentlessly advance and uphold ideas that are inclusive, honourable, selfless, smart and caring at every turn without fail. Let us not disappoint. And with that spirit and direction, let us turn now to the present. Two and a half years ago, Canadians gave our Government a strong mandate: a mandate to protect jobs and our economy; a mandate to keep taxes low; a mandate to make our families and communities safe. Despite ongoing uncertainty and instability from beyond our shores, our Government remains focused on these priorities. We made tough choices—the right choices for Canadian families. The results are clear: more Canadians have good jobs than ever before; families are paying lower taxes; our financial house is in order. As the world looks to recovery, a rare opportunity now lies before us as Canadians: the opportunity to build on our ingenuity, our immense natural wealth, and our values and stability; the opportunity to secure the future, for our generation, and our children’s generation. It is the opportunity to lead the world in security and prosperity—not for the sake of doing so, but so that Canadian families who work hard, pay their taxes and play by the rules can get ahead. This is Canada’s moment; together we will seize it. And as we do, we draw inspiration from our founders, leaders of courage and audacity. Nearly 150 years ago, they looked beyond narrow self-interest. They faced down incredible challenges—geographic, military, and economic. They were undaunted. They dared to seize the moment that history offered. Pioneers, then few in number, reached across a vast continent. They forged an independent country where none would have otherwise existed. With hard work, sacrifice and common sense, those Canadian men and women built this country. In so doing, they founded a constitutional democracy, among the most enduring history has known. As we look to the 150th anniversary of our Confederation, we are reminded that ours is a rich inheritance: a legacy of freedom; the birthright of all humanity and the courage to uphold it; the rule of law, and the institutions to protect it; respect for human dignity and diversity. Guided by these values, we Canadians—Aboriginal, French, English, people from all corners of the globe—strive together for our families and a brighter future. We are on the cusp of a moment that is uniquely Canada’s. Just as our founders dared, so too must we. We must seize this moment to secure prosperity, for Canadians now, and the generations to follow. Creating jobs and securing economic growth is and will remain our Government’s top priority. When disaster struck the world economy, our Government’s decisive and pragmatic leadership navigated Canada through the worst global recession in a generation. Even before the recession hit, our Government was prepared. It maintained budget surpluses and paid down billions from the national debt. It lowered taxes for Canadians and job-creating businesses. During the downturn, our Government’s Economic Action Plan took the steps necessary to safeguard our economy. It protected Canadian jobs. It invested in infrastructure and productivity. And it controlled spending, while maintaining growing transfers that support health care, education and retirement. In spite of continuing risks from beyond our shores, our Government is leading the world by example. It secured the commitment of the world’s largest economies to put in place credible plans to achieve financial sustainability. And it set clear targets to bring our own deficit down. Canada now leads the G7—in job creation; in income growth; and in keeping debt levels low. Canada is now among only a few countries in the world with a triple-A credit rating. By taking decisive action Canada has stayed strong where others have faltered. But we cannot be complacent. The global economy still faces significant risks from factors that we do not control. We must stay the course. And sound management remains our Government’s guide. Canadian families know they cannot prosper by continually spending more than they earn. Our Government is no different. And it will go further. Our Government will enshrine in law its successful and prudent approach. Our Government will introduce balanced-budget legislation. It will require balanced budgets during normal economic times, and concrete timelines for returning to balance in the event of an economic crisis. Our Government has already set an ambitious debt-to-GDP target of 25 per cent by 2021. And it will reduce that ratio to pre-recession levels by 2017. Just as our Government manages debt, so too is it tackling spending. Every day, Canadian families make tough choices about how to spend their hard-earned money. Guided by this example, our Government will continue reducing the size and cost of Government to ensure that taxpayers get value for money. Our Government will freeze the overall federal operating budget, which will continue to restrain hiring. Our Government will make further targeted reductions to internal government spending. Our Government will reform the way the federal system manages spending. Our Government will review federal assets; when it is in the best interest of Canadians, they will be sold. Our Government recognizes the value of a lean, competent and committed public service. Public Service pay and benefit levels will be reasonable, responsible, and in the public interest. Our Government has already reformed federal government pension plans, to ensure that parliamentarians and public servants pay their fair share. It will reform disability and sick-day entitlements and work with employees to get them back to work as soon as possible. Our Government will amend the Public Service Labour Relations Act to ensure that the Public Service is affordable, modern and high-performing. Our Government will increase performance accountability in the Public Service to provide better service to Canadians, at a reduced cost, and to better recognize dedicated and effective employees. And we will make government more efficient and responsive to Canadians--by, for example, moving from 63 different email systems to one. Canadians want good, well-paying, stable jobs. And our country needs Canadians working. Canadians know that businesses create jobs. So our Government lowered their tax burden and cut red tape. Canada now has the best job creation record in the G7—one million net new jobs since the depths of the recession. These are overwhelmingly full-time, well-paying, private sector jobs. But our Government is not stopping here. Canada has one of the best-educated workforces in the world. But there are too many people without jobs and too many jobs without people. To address this job creation gap, our Government is implementing the Canada Job Grant. It will increase employment by ensuring Canadians are able to fill job vacancies. Our Government will work with provinces and territories on a new generation of labour market agreements to more effectively connect Canadians with disabilities to employers and in-demand jobs. Canada’s youth unemployment rate is already much lower than many advanced countries. But it remains too high. Our Government will redirect federal investments in youth employment to provide real-life work experience in high-demand fields. In a dynamic economy, workers must be able to use their skills, wherever in Canada they choose to work. Provincial borders should not be employment barriers. Our Government will work with provinces and territories to improve credential recognition and enable the free movement of skilled workers. Our Government will ensure that Canadians are aware of the opportunities offered by the skilled trades, and will assist apprentices with the cost of their training. Our Government will complete reforms to the Temporary Foreign Worker Program to ensure that Canadians always have the first chance at available jobs. And our Government will continue to create the conditions for new and better jobs for Canadians across all sectors of our economy. This is why our Government launched the most ambitious trade agenda in Canadian history. In less than seven years, Canada has concluded new free-trade agreements with nine countries and our Government is negotiating further agreements involving more than 60 others. Our Government is also committed to expanding trade with emerging markets in Asia and the Americas through our engagement in the Trans-Pacific Partnership and active negotiations with Japan, South Korea, and India. To further promote the success of Canadian exporters, our Government will launch a comprehensive new plan to assist Canadian businesses as they expand abroad. Here at home, our Government will continue to work to remove barriers to trade between provinces and territories that cost jobs, inconvenience Canadians, and defy common sense. For instance, our Government will work with British Columbia and Ontario, and other willing jurisdictions, to set up a cooperative regulatory system for securities and capital markets. Since Canada’s earliest days, our economy has been built on our abundant natural resources. Directly and indirectly, the natural resource sector employs 1.8 million Canadians, many in skilled, high-paying jobs. Resource development generates 30 billion dollars annually in revenue that supports health care, education and programs Canadians cherish. Canada’s energy reserves are vast—sufficient to fuel our growing economy and supply international customers for generations to come. However, for Canadians to benefit fully from our natural resources we must be able to sell them. A lack of key infrastructure threatens to strand these resources at a time when global demand for Canadian energy is soaring. We must seize this moment. The window for gaining access to new markets will not remain open indefinitely. Now more than ever, our future prosperity depends on responsible development of these resources. At the same time, our Government has taken action to ensure that Canada’s resources do not fall under foreign government control. Our Government will continue to ensure that our natural resource sectors remain open to foreign investment when it is market-oriented and in the long-term interests of Canadians. Canada’s natural wealth is our national inheritance and our Government will ensure that the jobs and opportunities it brings are available to all Canadians. In particular, Canada’s Aboriginal peoples must have every opportunity to benefit. Act on advice from the Expert Panel on Tanker Safety, to create a world-class tanker safety system in Canada. Canada was built on the work of farmers, fishermen, and foresters. They work hard to feed our families and sustain rural communities. Our Government will continue to protect and promote Canada’s traditional industries. Our Government has given farmers marketing freedom and is helping them adapt and innovate. It will continue to develop new markets around the world for Canadian products, while supporting supply management. Our Government has supported fishermen by ensuring proper management of fish stocks and by opening new markets worldwide. It will continue to be open to solutions, supported by fishermen, that strengthen the economic competitiveness of this traditional pillar of our coastal economy. Forestry remains essential to Canada’s rural economy, supporting almost 200,000 jobs across the country. Our Government secured and extended the softwood lumber agreement with the United States. And our Government will continue to support innovation and pursue new export opportunities for Canadian companies. Infrastructure investment creates jobs, supports trade, drives productivity and contributes in a fundamental way to growth and long-term prosperity. For Canadians balancing the pressures of work and daily life, investment in our roads, bridges and transportation networks means less congestion, shorter commutes and more time with family. That’s why, in Economic Action Plan 2013, our Government launched the new Building Canada Plan, the largest long-term federal commitment to infrastructure in Canadian history. Over the next decade, our Government will invest 70 billion dollars in federal, provincial, territorial and community infrastructure. Projects such as building subways in the Greater Toronto Area, replacing Montréal’s Champlain Bridge, building a new Windsor-Detroit crossing and constructing Vancouver’s Evergreen Line will create jobs across our country. Our Government will work in partnership with industry to ensure that all major military purchases create high-quality jobs for Canadian workers. Our Government’s National Shipbuilding Plan will create 15,000 well-paying, skilled jobs over 30 years for Canadians and produce much-needed new ships for the Royal Canadian Navy and the Canadian Coast Guard. Canada’s automotive and aerospace industries are also key parts of our economy. That’s why our Government renewed the Automotive Innovation Fund and improved the Strategic Aerospace and Defence Initiative. Both have a proven track record of generating results for Canadians—jobs, prosperity and increased foreign investment. To foster Canadian productivity and global competitiveness, our Government provided 1.4 billion dollars in tax relief to manufacturing companies investing in modern machinery and equipment. And our new Advanced Manufacturing Fund will support new products and production methods. Our Government’s leadership in science and technology helps Canadian business remain competitive while creating high-paying jobs. Since 2006, our Government has invested more than 9 billion dollars to support science, technology and innovative companies operating at the outer limits of knowledge. Canada now leads G7 countries in post-secondary research investment. Transformation of the National Research Council, doubling the Industrial Research Assistance Program, and the new Venture Capital Action Plan are all helping to promote greater commercialization of research and development. Building on this strong foundation, our Government will release an updated Science, Technology and Innovation Strategy. Our Government will continue making targeted investments in science and innovation chains from laboratory to market in order to position Canada as a leader in the knowledge economy. And our Government will continue to promote Canada as a world-class destination for international students. Canada’s spectacular beauty attracts visitors from across the globe to every region of our country. These visitors create jobs and sustain local economies. Our Government will continue to work with industry partners to promote Canada as a top destination for tourism. Our Government has reduced the red tape burden on small and medium-sized businesses. There are now fewer regulations and the cost of red tape has been reduced by nearly 20 million dollars annually. Our Government will introduce legislation to enshrine the One-for-One Rule in law: for every new regulation added, one must be removed. The Canada Revenue Agency will cut additional red tape and help businesses navigate the tax system. And, following our Government’s return to balanced budgets, it will look at ways to provide further tax relief to job-creating small businesses. Canadians work hard for their money. And we know families are better placed to make spending decisions than governments. That is why our Government has lowered taxes, year after year—for families, for businesses, for each and every Canadian. Froze Employment Insurance premiums for the next three years, meaning that employees and employers will save 660 million dollars next year alone. Overall, the federal tax burden is at its lowest level in half a century. As a result of our Government’s low-tax plan, the average Canadian family now pays 3,200 dollars less in taxes every year. Our Government has a proven record of cutting taxes for Canadian families. We have delivered on our promises. And, once the budget is balanced, our Government is committed to greater tax relief for Canadian families. Canadian families work hard to make ends meet, and every dollar counts. While companies will look out for their bottom line, our Government is looking out for everyday Canadians. When Canadians make decisions about how to spend their money, they must be assured of a voice, a choice, and fair treatment. For example, although Canadians are among the most digitally connected in the world, we also pay some of the highest wireless rates in the developed world. As families know—especially families with teenagers—the monthly bills add up. Our Government has already taken action to achieve greater competition. Canadians know that competition is good for everyone. Competition lowers prices and keeps businesses from becoming complacent. As a result, wireless rates have fallen nearly 20 per cent since 2008. Our Government will take steps to reduce roaming costs on networks within Canada. Our Government will continue enhancing high-speed broadband networks for rural Canadians. And our Government will take additional action to protect Canadian consumers. Canadians are tired of hidden fees. They deserve to know the real cost of paying by debit or credit card. And they should not be charged more in Canada for identical goods that sell for less in the United States. Take further action to end geographic price discrimination against Canadians. Finally, our Government recognizes the daily risks taken by police officers and their service animals. It will bring forward Quanto’s law in honour of them. Families are the cornerstone of our society. Families raise our children and build our communities. As our families succeed, Canada succeeds. Our Government understands the daily pressures ordinary Canadian families face. And it is working to strengthen families, not replace them. That’s why our Government took money from bureaucrats and lobbyists and gave it to the real experts on child care—mom and dad. Our Government’s Universal Child Care Benefit provides 1,200 dollars a year to parents to help with the costs of raising kids. Our Government will also support hard-working Canadian families in other ways. Every day, parents make choices about what goes on the dinner table. Our Safe Food for Canadians Act was a significant milestone in strengthening Canada’s world-class food safety system. Our Government will work with the provinces and territories to further strengthen food inspection regimes. Our Government will consult with Canadian parents to improve the way nutritional information is presented on food labels. Our Government is also committed to ensuring that drug labels are written in plain language, and that the potential side effects of medication are accurately indicated. To help identify potentially dangerous drugs, and ensure the quick recall of unsafe drugs, it will introduce new patient safety legislation. This will include new powers to require reporting of adverse drug reactions. Work with the provinces and territories and with the private and not-for-profit sectors to encourage young Canadians to be more physically active. Canadian families expect safe and healthy communities in which to raise their children. They want to address poverty and other persistent social problems, access safe and reliable infrastructure, and enjoy a clean and healthy environment. Build on its record as the first government to achieve an absolute reduction in greenhouse gas emissions by working with provinces to reduce emissions from the oil and gas sectors while ensuring Canadian companies remain competitive. Since before Confederation, Canada has relied on railways for the movement of goods and passengers. It is no different today. New economic opportunities still require rail to link Canadian goods to waiting markets. Our Government has already amended the Railway Safety Act to further enhance the safety of rail transportation. As efforts to clean up and rebuild Lac-Mégantic demonstrate, railway companies must be able to bear the cost of their actions. Our Government will require shippers and railways to carry additional insurance so they are held accountable. And we will take targeted action to increase the safety of the transportation of dangerous goods. The first responders and ordinary Canadians who came together to confront the recent disasters in Lac-Mégantic and Alberta showed courage under the most dire circumstances. The Government has always stood with communities in times of crisis and recovery. Our Government will continue to support the citizens of Lac-Mégantic and affected communities in Alberta as they move forward. Building community resilience can mitigate the worst impacts of natural disasters and other emergencies before they happen. Our Government will work with provinces and territories to develop a National Disaster Mitigation Program, focused on reducing the impact of natural disasters. Government has no higher obligation than the protection of national sovereignty and the security of citizens. And Canadians know that you cannot earn respect by projecting weakness. Serious countries have serious capabilities. Look at the paintings that adorn this room—scenes of the Great War. They remind us of this, and of the profound sacrifices made by our men and women in uniform. These heroes are the pride of our country and the backbone of our history. After a decade of darkness, our Government has been living up to our promise to give the Canadian military the tools it needs to get the job done. Soldier for soldier, sailor for sailor, airman for airman, the Canadian Armed Forces are once again the best in the world. No longer does Canada have to hitch a ride with our allies. Our serving men and women can now carry out their vital missions. The Royal Canadian Air Force is flying new heavy-lift C-17 and C-130J transport aircraft, and operating Chinook helicopters. New tanks, artillery and other equipment have proven their worth in combat. Canadian workers at Canadian shipyards will build new ships for the Royal Canadian Navy and the Canadian Coast Guard. And our Government will complete our plan to replace Canada’s fleet of fighter jets. Building on these successes, our Government will renew our Canada First Defence Strategy. Now and in the future, Canada’s Armed Forces will defend Canada and protect our borders; maintain sovereignty over our Northern lands and waters; fight alongside our allies to defend our interests; and respond to emergencies within Canada and around the world. Assist employers of reservists who are required to deploy on missions vital to the security of all Canadians. As our Government takes these steps, it will always keep faith with those who have defended Canada with pride. Our veterans have stood up for us; we will stand by them. Our Government has made unprecedented investments to support our veterans. Invested almost five billion additional dollars in benefits and programs. Build on our successful “Helmets to Hardhats” program to place veterans in good jobs. We are a northern country. We are a northern people. Canada’s greatest dreams are to be found in our highest latitudes. They are the dreams of a North confident and prosperous, the True North, strong and free. Our Government is securing our Northern sovereignty; promoting prosperity for Northerners; protecting our Arctic environmental heritage; and giving the people of the North a greater say in their own affairs. Concluding a historic Devolution Agreement with the Northwest Territories and negotiating one with Nunavut. But the eyes of the world increasingly look enviously to our North. Our Government will not rest. Our Government will fulfill Prime Minister Diefenbaker’s historic vision by completing the Dempster Highway to the Arctic Ocean, linking Canada from sea to sea to sea. Our Government has established the Canadian High Arctic Research Station. This world-class science and technology research facility will open in time for the 150th anniversary of Confederation. With the arrival of our Government’s new Arctic Offshore Patrol Ships, Canada’s first deep water Arctic port at Nanisivik will be operational. Our Government recognizes that the future prosperity of the North requires responsible development of its abundant natural resources. Northerners must benefit from this treasure. Our Government will work alongside Inuit, First Nations, territorial governments and industry to ensure that Northerners are well trained to take their full place in this new economy. Our Government will also continue to defend the seal hunt, an important source of food and income for coastal and Inuit communities. The story of the North is the story of Canada. In order to tell that story for Canada’s 150th year, our Government will continue efforts to solve one of the most enduring mysteries of our past. We will work with renewed determination and an expanded team of partners to discover the fate of Sir John Franklin’s lost Arctic expedition. Canada stands for what is right and good in the world. This is the true character of Canadians—honourable in our dealings, faithful to our commitments, loyal to our friends. Confident partners, courageous warriors and compassionate neighbours. Canada does not go along to get along. Our Government defends Israel’s right to exist as a Jewish state, the lone outpost of freedom and democracy in a dangerous region. And our Government stands opposed to those regimes that threaten their neighbours, slaughter their citizens, and imperil freedom. These regimes must ultimately be judged not by their words, but by their actions. Canada seeks a world where freedom—including freedom of religion, the rule of law, democracy and human dignity are respected. Our Government will continue to promote these fundamental values around the world, including through the newly established Office of Religious Freedom. And Canadians know that freedom and prosperity march together. Our Government will help the world’s neediest by partnering with the private sector to create economic growth in the developing world. Tax dollars spent on foreign aid must achieve real results. Our Government’s international aid will continue to be focused, effective and accountable. Canadians also know that free and healthy societies require the full participation of women. Canada has taken a leadership role in addressing the health challenges facing women, infants and children in the world’s poorest countries. These efforts are saving millions of lives. In particular, Canada recognizes the courageous and inspiring example set by Malala Yousafzai in risking her life promoting education for young women. She faced down evil and oppression and now speaks boldly for those who are silenced. Recognizing her heroism, our Government will, on behalf of all Canadians, bestow honorary citizenship on this remarkable young woman. Sadly, millions of women and girls continue to be brutalized by violence, including through the inhumane practice of early and forced marriage. This barbarism is unacceptable to Canadians. Our Government will take steps to ensure that it does not occur on our soil. It is the reality of our country that Canadians of very different origins live and work side by side, together. New Canadians work hard to learn our languages, our values, and our traditions, and in turn, are welcomed as equal members of the Canadian family. Our Government inherited a broken immigration system, and has worked hard to fix it. Remained on track to meet our goal of reuniting families faster. But there is still more our Government can and will do. We know that a job is the best path to social integration. Our Government will introduce a new model to select immigrants based on the skills Canadian employers need. Our Government will reform the Immigrant Investor Program so that these investors make a real contribution in exchange for the security and pathway to citizenship that Canada provides. Canadians understand that citizenship should not be simply a passport of convenience. Citizenship is a pledge of mutual responsibility and a shared commitment to values rooted in our history. Our Government will not hesitate to uphold the fundamental rights of all Canadians wherever they are threatened. As we look confidently to the future, we draw great strength from our past. Beginning with our Aboriginal peoples, Canada’s story is one of risk, sacrifice, and rugged determination. From the founding of New France, to the fight for Canada in the War of 1812; from the visionary achievement of Confederation, to our victory at Vimy Ridge, Canadians have repeatedly triumphed over long odds to forge a great country, united and free. It is a story we recall with wonder and recount with pride. A story of how different provinces founded a federation in which our distinct strengths advance our unity. A federation in which Canada's two national languages position us uniquely in the world; where francophones thrive and celebrate a unique culture, in solidarity with fellow Canadians. Our Government has recognized the Québécois as a nation within a united Canada. It will work with the Government of Québec to ensure our common prosperity. And our Government will continue to respect the division of jurisdiction at the heart of the Constitution adopted at Confederation. Working with Canadians to support community projects, local celebrations, and other initiatives to commemorate this historic occasion. The coming anniversary of Confederation is also a time to mark the contribution of Canada’s First Nations, Métis and Inuit communities, who have had a defining role in shaping our country. Our Government will continue our dialogue on the treaty relationship and comprehensive land claims. And our Government will continue to work in partnership with Aboriginal peoples to create healthy, prosperous, self-sufficient communities. The road to 2017 is a fitting time to strengthen our institutions and democratic processes. And, the Government will propose changes to Canada’s elections laws to uphold the integrity of our voting system. Legislation will be introduced in time for implementation prior to the next federal election. His vision has come to pass. Today, Canada is a model for the world. Admired for our freedom. Respected for our principles. Envied for our openness, compassion and peaceful pluralism. As we approach the 150th anniversary of our great land, we look to the future. A future we will face true to our character, the character of a determined and enterprising people: Canadians, whose shops and small businesses spur the growth of our towns and cities; who work factory shifts and drive taxicabs to help their families get ahead; who take the same pride in raising their children as they do in being citizens of the best country on earth. These are the quiet, unsung Canadians who are building our country. It is from them that we draw the inspiration to face an uncertain and unstable world. It is for them that we will seize the moment before us. Honourable Senators and Members of the House of Commons, you are the holders of a profound trust reposed in you by Canadians. May you be equal to that trust in all things and may Divine Providence guide you in your deliberations. That the Speech of His Excellency the Governor General, delivered this day from the Throne to the two Houses of Parliament, be taken into consideration later this day. Pursuant to Standing Order 28(2)(b), I have the honour to lay upon the table the House of Commons calendar for the year 2014. I have the honour to lay upon the table a certified copy of the report of the Federal Electoral Boundaries Commission for the province of Ontario. Pursuant to section 22 of the Electoral Boundaries Readjustment Act, the report was published and made public on Monday, September 30, 2013 in an extra edition of the Canada Gazette. This report is deemed referred to the Standing Committee on Procedure and House Affairs. I have the honour to inform the House that Mr. Duncan, member for the electoral district of Vancouver Island North, has been appointed member of the Board of Internal Economy in place of Mr. O'Connor, member for the electoral district of Carleton—Mississippi Mills, for the purposes and under the provisions of section 50 of the Parliament of Canada Act. Mr. Speaker, I move, seconded by the chief government whip, that, notwithstanding any Standing Order or usual practice of the House, the ordinary hour of daily adjournment of today's sitting be 8 p.m. It is my duty to inform the House that a total of five days will be allotted for the supply period ending December 10, 2013. I am now prepared to propose for the ratification of the House a candidate for the position of deputy chair of committee of the whole. Pursuant to Standing Order 8, I propose Mr. Barry Devolin for the position of deputy chair of committee of the whole. I am now prepared to propose for the ratification of the House a candidate for the position of assistant deputy chair of committee of the whole. Pursuant to Standing Order 8, I propose Mr. Bruce Stanton for the position of assistant deputy chair of committee of the whole. This motion is deemed moved and seconded. Is it the pleasure of the House to adopt the motion? Mr. Speaker, I propose that notwithstanding any Standing Order or usual practice of the House, when government Motion No. 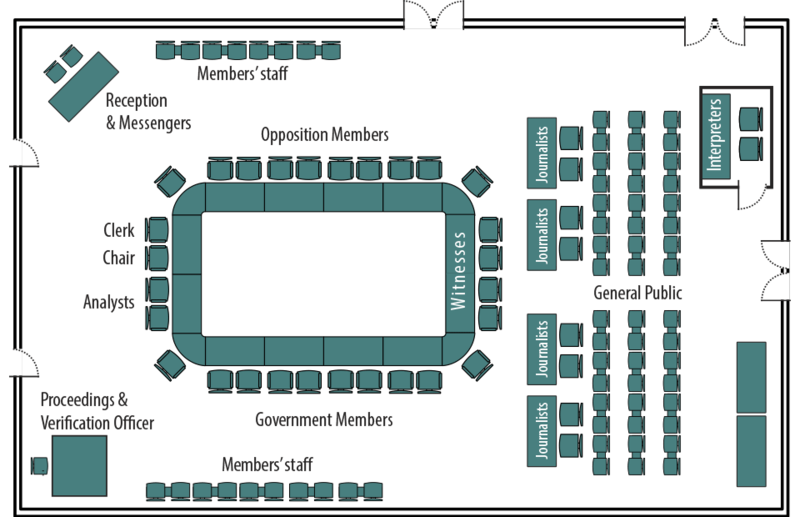 1 is called, no member shall speak for more than 10 minutes, with no question and comment period, provided that members may divide their time with another member; the Speaker shall not receive any amendments; and when no member rises to speak or after 40 minutes of debate, whichever is earlier, the motion shall be deemed adopted on division. It being 6:30 p.m., the House stands adjourned until tomorrow at 10 a.m., pursuant to Standing Order 24(1).